This is another one of THOSE posts. I’ve broken the post down into segments so feel free to jump through the numbers. Our facility and the hitting philosophy that is currently being employed under its roof – #LegKickNation – is admittedly contrarian. Due to this, there has been some vitriol espoused by conventionalists on our social media pages. Unfortunately, 140 characters is limiting to public discourse, so I will try to address some recent shots thrown our way. 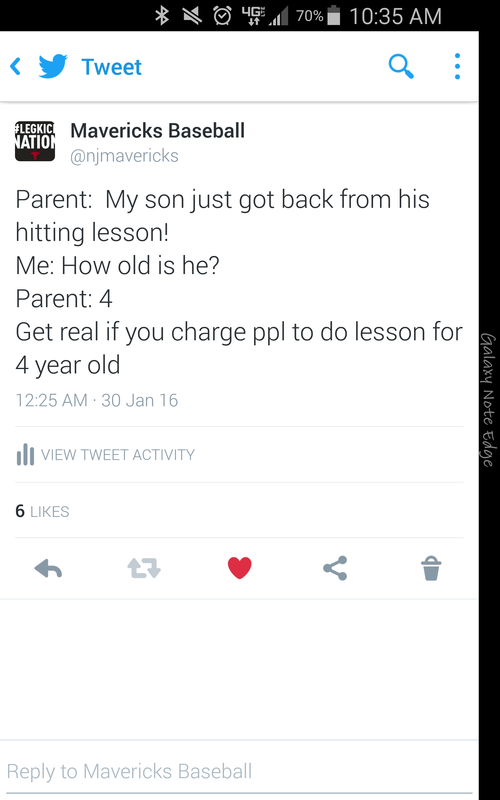 In response to this, we received a tweet from a local hitting instructor who did not appreciate our thoughts. I would share his response tweet, but it was so eloquently written that – ironically – some of the words in the post are not appropriate for the 4 year olds he is making a living off of. Our brains are amazingly complex having evolved after centuries of sequential adaptation. After the Paleolithic behavioral revolution, cognitive and social traits exploded as we evolved from independent hunter-gatherers to a socially dependent species. According to British anthropologist Robin Dunbar, “human intelligence did not evolve primarily as a means to solve ecological problems, but rather as a means of surviving and reproducing in large and complex social groups.” In short, our brains evolved to match our biological dependence on social interaction. This serves as the foundation for cerebral modernity – our amazingly complex socially dependent brain that is capable of simultaneously monitoring our heart rate while coordinating a complex socio-economic construct. However, with all things in our lives, complexity comes at a price. In order to maximize performance, our cerebral and biological systems have to be given time to develop. Development – from a biological and social perspective – is gained through a long-term failure-learn-growth process. Further, every brain – as with every person – is completely unique with billions of specialized neurons that process, adapt, fire in different ways from the next person. Therefore, how do we square this circle? How do we allow the time and freedom necessary for student-athletes to self-discover, grow, learn while providing a platform that effectively stimulates the brain’s social constructs – all which are biologically unique from the next? THIS IS THE FUNDAMENTAL CHALLENGE WITHIN ATHLETIC EDUCATION. And, in every way possible, the traditional methods of instruction – lesson based, 1 on 1, internal focus driven – do not provide the right type of growth parameters for our student-athletes. Everything we do – all the money that is spent, all the hours wasted, all the 4 year olds that are “taught” – all wholly ineffective in the face of educating a uniquely complex organism. As previously mentioned, research into social neuroscience has provided us with an insight into how we learn. As professional educators, it is our job to provide a framework that optimizes the learning environment for student-athlete growth. Unfortunately, most athletic instructors are far from “professional educators.” In fact, most would neglect the fact that what they are doing is education in the first place. To that end, below are some insights into current traditional training methods and why – as outlined in our original tweet above – 1 on 1 lessons are inherently flawed. Research has shown that individual instruction on it’s own accord has zero correlation with athletic growth. Conventional instruction – for a four year old or otherwise – does NOT create a social platform in which a student-athlete can grow. Our brains – through evolution – are dependent on the social constructs within our environment. The relationships we develop at early ages are paramount to our physical and social growth. Early relationships shape our cerebral-structures in ways that have a lifelong impact. To that end, in order to effectively grow, we must be socially connected with those we surround ourselves. Therefore, it is not a bonus to surround yourself – or your child – with positive influences. It is a biological necessity; as close supportive relationships stimulate neuroplasticity and provide a platform for advanced learning. In conventional athletic instruction, a student-athlete has an arbitrary timed (read below) “lesson” usually in a 1 on 1 environment. Even if it’s a “group” lesson, there is a teacher-student taxonomy in place. Research suggests that this “relationship” inhibits autonomy as students believe the responsibility is on the teacher to teach instead of placing responsibility on themselves to learn. And in a situation in which a lot of money is going to the teacher, wouldn’t it follow that he/she be responsible for the “teaching.” Consequently, the focus for both – teacher and student – centers on the teaching method; rather than the learning. This is why one of the most prevalent complaints from both athletes and parents alike is: “the coach is (insert negative jab here).” There is zero learner autonomy because analysis, feedback – and ultimately performances – is the responsibility of the instructor. Our inherent quest to discover answers about our world – our urge to explore and seek knowledge – is an important aspect in our growth. Neuroscience shows that when we are allowed to seek answers and discover truths for ourselves – dopamine is released in our brains. Dopamine is a neurotransmitter that helps control the brain’s reward and pleasure centers. Dopamine also helps regulate movement and emotional responses, and it enables us not only to see rewards, but to take action to move toward them. Unfortunately, by restricting autonomous growth, lessons restrict the brains biological processes. Studies continually affirm the notion that autonomous learners engage in higher-order processes as well as lower-order cognitive and motivational processes. These metacognitive processes are foundational elements in student-athlete growth. Therefore, how can a lesson in which there is a singular “expert” voice who is responsible for “teaching” foster an autonomous learning environment? It can’t. And because it can’t, abstract and lateral learning during a traditional lesson is actually impeded not facilitated. In education, there is a teaching methodology referred to as “chunking.” Basically, it is breaking concepts into meaningful segments – or for you Karl Popper fans out there – focusing and training our deductive reasonings. In athletics, when mechanics are represented at higher levels of abstraction, learning can be integrated into larger schemas that enhance cognitive flexibility and broken down into more repeatable action plans based on external feedback. For example, a baseball hitter may direct their focus on how to property utilize angular rotational forces to apply force to the barrel. Using external cues to measure this, the player would focus on the result of the baseball (trajectory, exit velocity, etc.) rather than some subjective feel or internal cue (“pull hands inside baseball”). However, traditional lessons focus almost solely on internal instruction: do this with your hands, move your hip this way, etc. Unfortunately, our brains evolved to learn through trial-and-error exploration. The focus on internal cues and inductive reasoning – focus on parts not the sum – deprives kids of their athleticism and negatively impacts long term learning. In order to truly learn, we need to focus on big things and break them down autonomously and deductively. We are wired to try, fail, learn, try, fail, learn. Since we are not wired to listen to an external actor give us cues; how can a 1 on 1 lesson provide anything of substantive value? Why do lessons always go in 30 minutes or one hour time slots? Research proves that learning retention is unique to every learner. Simply put, kids learn at various rates. So the lesson times – 30 minutes, 1 hour – it’s all an unscientific, arbitrary number; created simply to herd kids in and out of facilities to make money. Our brains evolved as vigilant organs in the face of a constantly changing environment. Therefore, we learn best in short intervals to match our brains biological foundation. Intermittently paced workouts and multichannel workouts focusing on same big picture goal have proven to increase several cerebral and physiological functions. However, most lessons consist of the exact same drills at the exact same pace at the exact same time – because they all run the exact same length under the same guidance of the same “teacher.” So what’s good for Player A is good for Player B and vice versa. Unfortunately, this cookie cutter approach truly handcuffs student-athlete growth. So how can a cookie cutter approach that limits multichannel engagement possibly be unique enough to strengthen the neurons necessary for growth? Why is it that per capita Dominican born athletes are significantly more advanced than their US born counterparts? Similarly with soccer in Brazil, Dominican athletes don’t grow up taking weekly hitting/pitching lessons in which they are not accountable for their own learning. In fact, most Dominican players attribute their success to “Vitilla” – a stickball type game in which players hit bottle caps. During the game, there are no controlled lessons in which internal cues are provided. There is no 3rd base coach giving the bunt sign, telling hitters to hit groundballs, or simply “throw strikes.” Rather, there are constant repetitions in restrictive situations in which external analysis (what the ball did, where the ball went) and mirror repetition (swinging like an MLB player) is the main teacher. As outlined above, athletic learning involves the strengthening of connections between neurons. Repetition helps support this learning. According to Gladwell, it is a necessary component to be great. But in conventional lessons, we are handcuffed by time and by constant internally focused instruction. So repetitions are sacrificed significantly. And moreover, because autonomy has been limited, student-athletes subconsciously turn off their desire to learn the subject outside of the lesson. Again, it’s not the student’s responsibility to teach themselves – they are paying a professional instructor for that. So how can a 1 on 1 lesson provide the necessary repetitions necessary to reach elite levels? Modern hourly lessons can cost hundreds of dollars a session. Therefore, there is a ceiling to the amount of training a student-athlete can undertake due to the restrictive cost structure of conventional lessons. If the above were already severely limiting growth factors, the cost structure may be the biggest scam within amateur athletic education today. As outlined previously, student-athletes need repetitions to improve their mechanical movements. And not just some repetitions – but a LOT of deliberate repetitions. However, the conventional lesson – for a four year old or other – is so cost prohibitive that students will NEVER get the optimal amount of reps necessary just doing lessons. How then, can a 1 on 1 lesson provide enough reps to make any positive biomechanical impact. Anecdotally, the most physically gifted players I’ve coached are the ones who grew up playing with those that are bigger, better, faster, older. As humans, we learn from watching others and emulating their strengths while -consciously or subconsciously – analyzing their weaknesses. Recently, there has been much debate on “mirror neurons.” Our brains may contain the capacity – at the neuron level – to mirror behavior through observation alone. How then, can a 1 on 1 lesson provide a community in which we can be pushed by other’s and learn through “mimicry” to maximize our performance. Hitting is a similar athletic sequence that takes place at such a rapid rate – the naked eye can’t capture what is going on. However, I don’t see a lot of video analysis going on in lessons these days. Which leads me to believe that there are a lot of superhero’s posing as hitting/pitching instructors – or people are being fleeced. I would bet on the latter. If someone is being paid for their “expert” advice – how can they wholly help to educate student-athletes without even being able to see what is actually happening? Does this “professional” view athletics as an educational process? If so, how does the instructor impart an athletic education? Are they teachers and students themselves? Do they research epistemology and learning paradigms? Or are they former players who are simply looking to make some money? How does the lesson foster an environment that makes learning the quintessential focus? Do they provide a platform for a community to grow? Will you or your son/daughter get the biologically necessary social connection? 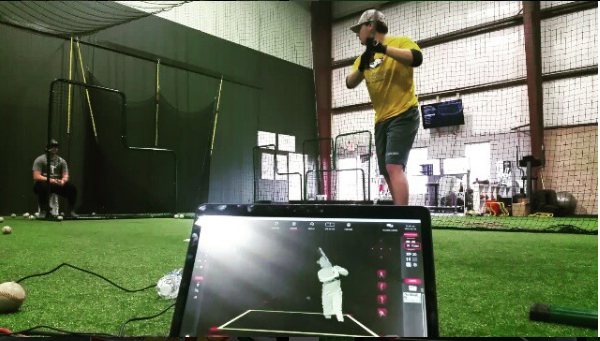 Does your instructor provide video analysis? Or are they relying on questionable biomechanical analysis using the naked eye? If their naked eye can internal rotation velocities of 7000-9000 degrees then they probably should use their talents to save the world. Do they provide video, clips, information that you can review on your own time to analyze your movements? Or… you can become a member of our athletic education institute.